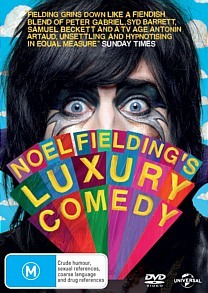 Noel Fielding's Luxury Comedy DVD Review If you can multiply this amusing if nonsensical absurdist outburst by about thirty minutes, you’ve got some idea of what the show entails. As for me, I think I’ll stick to watching old episodes of The Mighty Boosh. Thus spaketh Noel Fielding, best known as the younger, hipper and more slender half of the comedic duo responsible for The Mighty Boosh, itself no slouch in the colourful psychedelia department and, for the record, one of the most original and kookily enjoyable comedy series of all time. Having temporarily parted ways with longtime collaborator Julian Barratt, Fielding has this time around teamed up with Boosh animator Nigel Coan to create a 7-part sitcom that is so freaky, psychedelic and downright absurd it makes his former brainchild look positively staid in comparison. Whereas Barratt knew when to rein in Fielding’s outré excesses and provided a perfect contrast with his (comparatively speaking) straight-man routine, this time around Fielding has no counterpoint, and the madcap, freeform, partly-animated series that results is a tie-dyed rainbow sludge of vomited nonsense that splatters its way onto the screen and brings to mind nothing so much as the inner workings of a schizophrenic’s unconscious during a particularly potent acid binge. The episodes hinge on a loose framework that principally involves a heavily made-up Fielding mincing around in various costumes as a host of Boosh collaborators like Rich Fulcher and brother Michael Fielding interject their own meaningless and seemingly stream-of-consciousness blatherings. The end result is largely incoherent, but worse than that it just isn’t much fun. It’s too zany, too self-consciously garish, more psychotropic than psychedelic. Characters come and go without raising much more than a titter, they aren’t memorable or quotable like Old Gregg or Fielding’s neurotic Man in the Moon, in fact they aren’t really much of anything. Then he breaks into laughter and asks off camera ‘What am I doing? Is any of this helping?’ If you can multiply this amusing if nonsensical absurdist outburst by about thirty minutes, you’ve got some idea of what the show entails. As for me, I think I’ll stick to watching old episodes of The Mighty Boosh.